Regional property markets expanded 0.4 per cent during the three months to 30 November, while capital city markets gained only 0.2 per cent, according to the latest CoreLogic November Hedonic Home Value Index. Hobart's property market is the fastest growing in Australia, but it's small size means it does not contribute greatly to overall flat results. For the month of November, regional markets gained 0.2 per cent, while the capital cities eased a modest 0.1 per cent. The diversity of the Australian property market is on display in the latest CoreLogic numbers. “Softer housing market conditions across Sydney, which comprises roughly one fifth of national dwelling stock (and approximately one third by value), has a material influence over the headline growth trends," wrote Tim Lawless, head of research with CoreLogic. Hobart and Darwin together only account for 1.5 per cent of total housing stock in Australia, he said, so despite their relatively large percentage moves, their results have little impact on the overall capital city results. Lawless said the data shows the Perth property market might be over the worst. Perth dwelling values have edged higher over each of the past three months to record the first rolling quarterly capital gain since late 2014, he said. 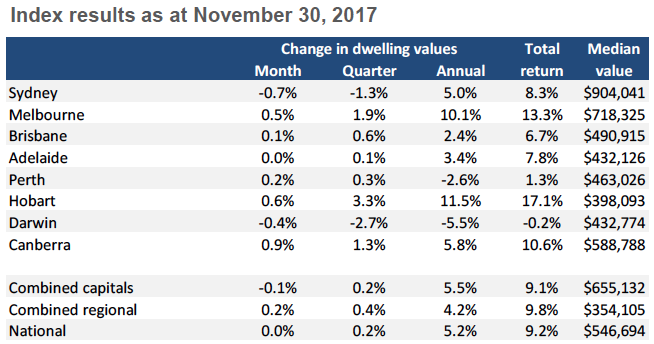 In the three months to November, Perth dwelling values rose 0.3%, settled sales are up 3.8 per cent, and homes are selling within 59 days compared with 68 days a year ago. Advertised stock is down 12.7 per cent compared with last year, he said. "If this is indeed the start of a recovery phase in the Perth housing market, it comes after dwelling values have fallen 10.8 per cent since peaking in mid-2014," he said.